A spectacular rail crash in September 1955 on the New England side of Westwood Bridge. Amazingly, the derailment only resulted in injuries rather than fatalities. Reg Johnson, a BR Fireman at the time recalls, “I was firing a goods train from Melton Mowbray to Peterborough East and we passed by the crash within minutes after it happened on the line to the far left of this picture. The engine in question was the only one of its kind running on British Rail, designated as a “W-1” class No 60700 that had been streamlined in 1937 with a wheel displacement of 4-6-4 and more commonly known as the “Hush Hush” although it was never named and not of the Mallard Type A-4 streaks. 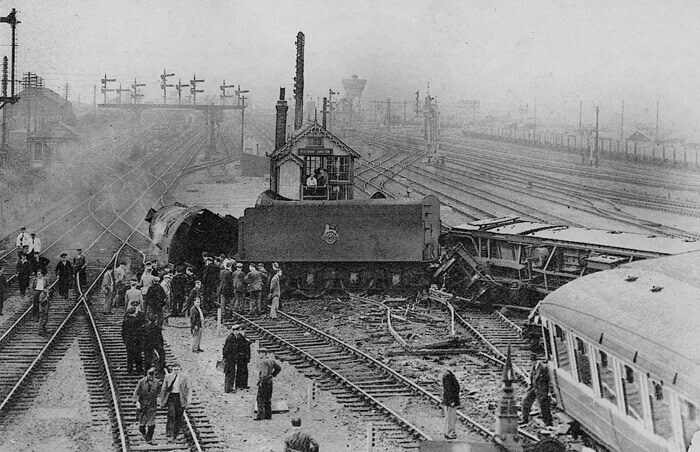 As far as I can recall the only casualty of this crash was the signal box boy who was watching it come towards him”.